The tutoring specialist announced robust enrollment growth for the fiscal third quarter. Chinese after-school tutoring specialist TAL Education (NYSE:TAL) beat the market last month by gaining 13% compared to a 7% slump in the S&P 500, according to data provided by S&P Global Market Intelligence. The rally wasn't quite enough to put investors ahead of the market for the year, though, and shares remain down slightly as the S&P 500 has gained nearly 5%. Last month's gains came following the announcement of solid operating results for the fiscal third-quarter earnings. TAL Education booked a 54% spike in sales to $700 million, in fact, which surpassed the expectations of most investors who follow the stock. Enrollment trends were healthy, increasing 120% year over year as the company gained students in both its online and offline segments . 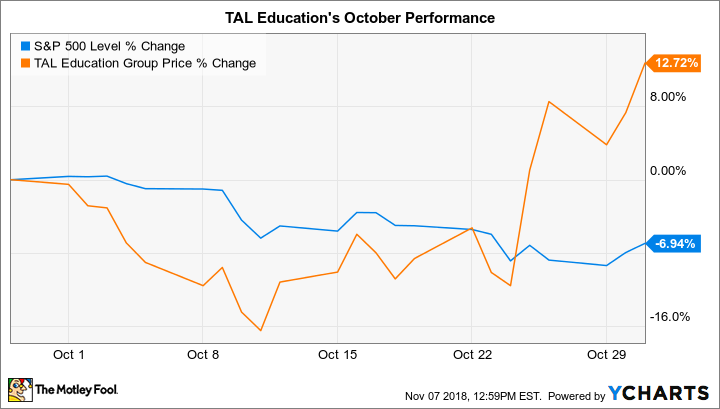 TAL Education executives predicted that sales will land between $563 million and $572 million in the current quarter, which would translate into slower growth of around 30%. Over the longer term, investors will be watching for signs of improvement in its elevated sales and marketing expenses so that the company can follow up on its strong enrollment gains with rising profitability, too.